65% polyester/35% cotton 6 ounce soil release treated twill shirt. Fabric is stain and wrinkle resistant. Repels water and oil based spills. Button down collar, woodtone buttons and left chest pocket. 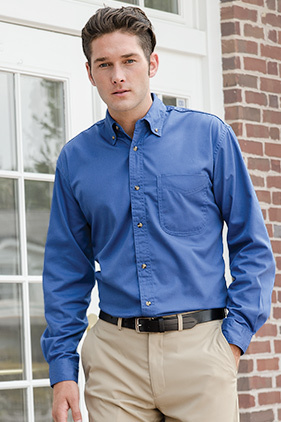 Long sleeve has adjustable two-button cuff with single button wrist placket.